We dress a lot alike and like a lot of the same styles, which is no surprise. It’s even why we initially became friends! But despite our similarities, we do both have a signature style that is unique to us. We thought it would be fun to share our two favorite outfits of the spring/summer season and explain how they typify our particular style. Hmm…which outfit from our spring/summer Instagram posts best exemplifies my personal style? Which outfit made me feel the happiest, most stylish when I put it on? I’d have to say my fun floral top, white jeans, and black peep toe booties. I love wearing an elevated, casual look. When I saw this blouse, I was attracted to the bright print. I also love how it’s off the shoulder, but has straps. The flowy sleeves are so feminine and pretty! The print really pops when paired with the white jeans. I also love wearing peep toe booties. They give a nod to spring/summer, but can also be worn in the transition to fall. I like shoes that cover a lot of my upper foot–it’s more attractive on me than showing my bare feet! A fun finishing touch to this outfit is this round purse. It’s fun having an updated purse shape, and the black color has gone with so many of my outfits! I didn’t expect to wear it as much as I have…it was a great purchase! I guess this elevated, casual look is fun for me, because it takes me a lot of places that go along with my lifestyle – date nights, girls’ get-togethers, meetings, work, etc. It’s fun to take a casual outfit element like a pair of jeans, and by adding fun accessories and a dressy top and heels, the outfit becomes special, stylish and fun to wear! My second favorite outfit would have to be my off the shoulder gingham top, white earrings, and boyfriend distressed white denim jeans. I got this top last year and only wore it a few times. I wasn’t super confident in the gingham print. I wondered if it made me look too little girly. Well, this season gingham print exploded onto the scene!! Women of all ages started wearing it on tops, shorts, skirts, etc. 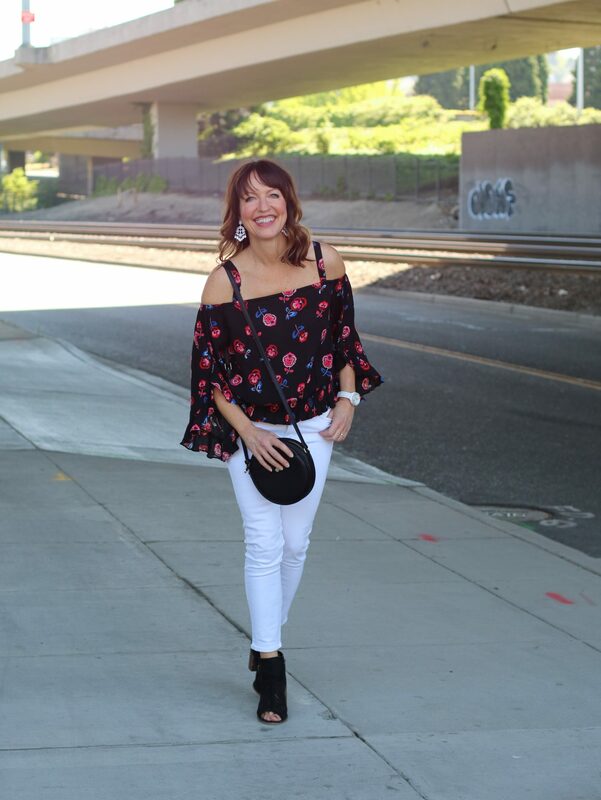 So, I confidently started wearing this cute blouse this season, and I’ve loved it! These jeans were also a stretch purchase for me. I loved the fit, but these are definitely the most distressed jeans I’ve ever owned. I love how they are more relaxed, so my skin doesn’t push out of the holes lol. They have a comfy, cool vibe that goes with my casual lifestyle. Another element of this outfit that I’ve worn with a variety of outfits (you’ll see them a lot on our Instagram feed) is my bright, white earrings. They are big, fulfilling the statement earring trend, but not too huge. The bright white floral design really shows up against my dark hair. The way this outfit came together pushed me out of my comfort zone and made it a real favorite! Well, that’s a hard act to follow…Krista is way better at talking about what she loves about her outfits than I am. I’m like, yep, this here outfit is kool. It might not be quite that bad, but the idea for blogging definitely came from me listening to her explain the thought behind every detail of her outfits. She’s full of styling wisdom! 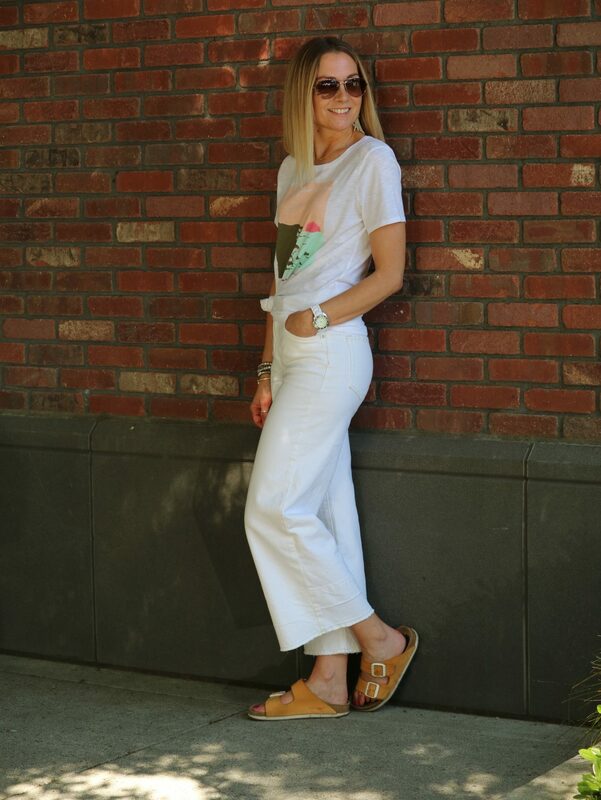 One my fave outfits was my wide leg white pants with the graphic tee. I like every outfit to have a modern”edge” but also to feel completely confident and comfortable in what I’m wearing. The wide leg trend is the “edge” in this outfit, and I love the flattering cut and fit of these jeans. Styling high-waisted pants can be tricky though, so I tried to pair the jeans with a top that bisected the inseam so the waist would be balanced (not too long of an inseam). The looser fit of the tee also made my outfit comfortable and gave my upper body more bulk so the focus wouldn’t be on my hips. I love how knotted tops are on-trend right now, so adding the knot to the front provided the double advantage of highlighting a current trend and also adding a curvier silhouette. I always feel more comfortable when dressed a bit more casually, so wearing Birkenstocks kept me completely in my comfort zone. I could wear this outfit everyday and everywhere, except it would really impact my laundry pile. Ok, I know I just said I preferred comfortable and casual, but IF I was to have a night out (kinda rare), this is what I would most likely choose. One of my goals this season was to find some “going out” tops and this one from the hisugarplum (@cassiesugarplum) collab with Nordstrom was a slam dunk for me–good coverage in all the right places, a flattering knot detail that emphasizes the waist, and MOST important for this unendowed gal…adjustable straps! I’m not afraid of color, but I lean toward simple and classic looks, so this black & white palette with subtle accents of glittery gold on the sandals and a velvety bag adds just the right touch of “edge” for me. Here I am wearing white jeans again, but I just can’t get enough of them in the summer. Straight leg, cropped, wide leg–I like to have more than one pair because they need to be laundered more often and I always want one at least one option on rotation. This look is perfect for me because I would feel dressed up, but not TOO dressed up for a night out or other special summer event. 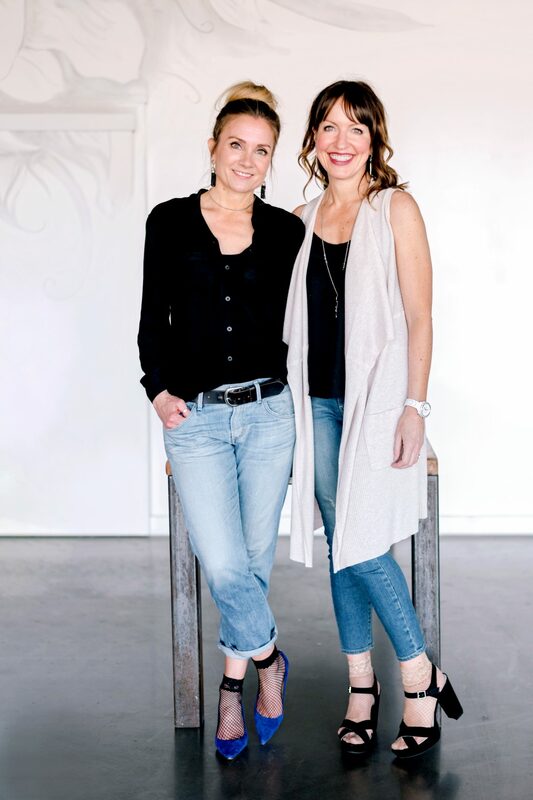 It’s fun to look back and see how our styles are alike but actually very true to our personal styles. Our body types, coloring, and lifestyles definitely play a role in how we express ourselves through what we wear. Have you thought about your signature “style”? You may not even think you have one, but ask a friend, and they could probably tell you that you do! What would you say your favorite outfit has been this season?